INDEPENDENCE DAY SEQUELS 2 & 3: "INDEPENDENCE DAY FOREVER"
INDEPENDENCE DAY SEQUELS 2 & 3 WITHOUT WILL SMITH? : SO WHO WILL WELCOME THOSE ALIENS TO "EARF?" Its hard to believe that its been seventeen years since we saw those iconic images of the White House and other landmarks being blown to smithereens. Or hearing Will Smith's memorable line "Welcome to Earf" (in his Philly accent) after chin-checking an alien invader sporting a dread-lock coif. Yes, to the dismay of those old enough to remember ID4 they're some tiny boppers just waiting to remind you of your age when these sequels hit theaters. You'll know it the moment you hear some pre-pubescent voice next to you in line say, "So, like, what's the big deal with this movie anywaaayyyyyy? 'Cause OMG! I can't find it on Facebook anywhere!" Recent reports on Screenrant reveal two sequels are in the development stages. Latest reports are that director Roland Emmerich and producer Dean Devlin are still struggling to find financing. Bill Pullman who played The U.S. President in the last film stated that he has received two different scripts for the upcoming 2014 or 2015 release of the first sequel. One has Will Smith's character and the other doesn't . Pullman is reportedly happy with both, but I wonder if fans will except a sequel without Smith? Website Bleeding Cool surmised that based on an interview with producer Dean Devlin the studio (FOX) is not willing to sign off unless the vast majority of the cast (sounds like Smith) returns. There has also been no mention of Jeff Goldblum returning either. But hey it's Hollywood, things change quickly. In keeping with Hollywood's new love affair with (you guessed it) 3D, there is expected to be 2D and 3D formats released in theaters. I'll keep my peepers peeled for new information on any developments. 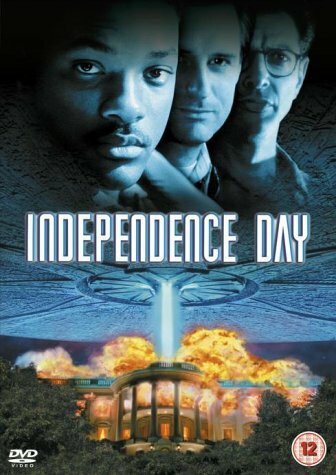 In the mean time expect a 3D re-release of the original Independence Day in theaters July 3, 2013.<---Parents do us a solid and make the kids see this one. Afterwards, they can Tweet-it, YouTube-it, and Facebook-it...until then, DEUCES !